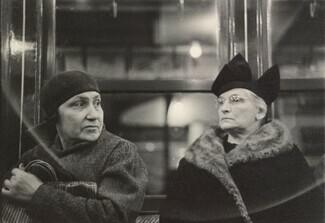 In 1938 Walker Evans embarked on a radically new series of photographs. He concealed his 35mm camera under his coat—its lens poking out between his buttons and a shutter release down his sleeve—and surreptitiously photographed subway riders in New York. Aware that people would inevitably compose themselves and alter their expressions if they knew they were being photographed, he did not raise the camera to his eye to look through its viewfinder, nor did he adjust its focus or exposure, or use a flash. Evans abandoned all the controls that a photographer normally employed and strove to make portraits of "detachment and record," dependent on chance and intuition. People’s faces are in naked repose down in the subway. Sid Grossman, a native New Yorker, cofounded the Photo League with Sol Libsohn in 1936, a left-leaning organization that supported photography as an agent of social and political change. While serving with the Army in Panama during World War II, however, Grossman’s photography moved away from social documentary toward a more creative approach. After his military service, Grossman returned to New York and continued his new artistic trajectory. 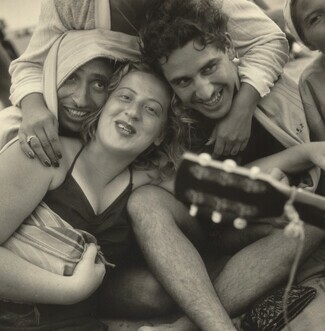 In the photographs made in Coney Island, Grossman’s tight cropping conveys the vitality of the teenagers who congregated there. A self-taught photographer and cofounder of the Photo League, Sol Libsohn believed that "unless you feel an involvement with people, with the human condition, you should not photograph them at all." The son of Eastern European immigrants, Libsohn's social and aesthetic sensibilities were born of the experiences of the Depression. Born Usher Fellig, Weegee emigrated from Austria to New York in 1910, moving with his family to a cold-water tenement in Manhattan's Lower East Side. After dropping out of school at fourteen and working at a variety of jobs, he was hired as a darkroom technician for Acme Newspictures (later United Press International Photos), and began covering the nightly fires when the regular photographers were off duty. After 1935, he worked as a freelance photographer covering the murders, fires, and accidents in the city, which he sold to the tabloids and photographic agencies. A master of flash, Weegee frequently caught his subjects off guard, recording their momentary expressions of pain, shock, or terror with a stark immediacy. After abandoning his job as a science teacher in East Harlem, Paul Himmel worked as a commercial photographer for Harper's Bazaar. There he met and studied with Alexey Brodovitch, who once said of him: "Of all my protégés, he was the one who best understood what I meant about movement." Fascinated by the human figure in motion, Himmel himself has said: "I thought choreographically." He explored this theme not only in this photograph of a crowd at Grand Central Station, but also in his 1954 book Ballet in Action. 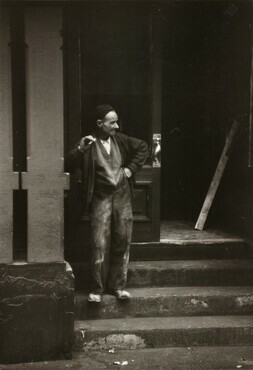 In the mid-1940s Faurer moved from his hometown of Philadelphia to New York, where he met and shared a studio with Robert Frank. 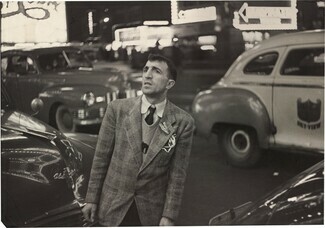 Faurer claimed the "hypnotic dusk light led him to Times Square" where he photographed daily, immersing himself in the culture of postwar America. While he reveled in the gritty, occasionally bizarre aspects of the city, his photographs were rarely without tenderness. 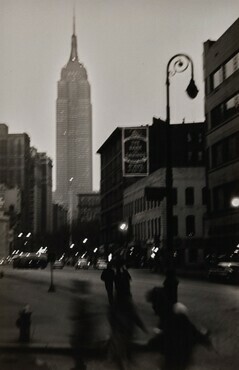 This photograph, one of Croner's most well-known works, evokes the fevered pace and luminosity of nocturnal New York. 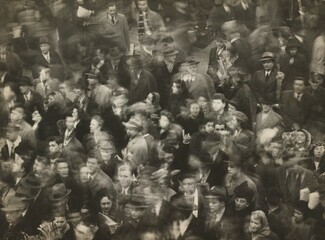 Croner did not use a flash, but rather took long and multiple exposures—often holding the shutter of his camera open while moving—to create streaked and blurred lines that give the impression of a metropolis constantly in motion. 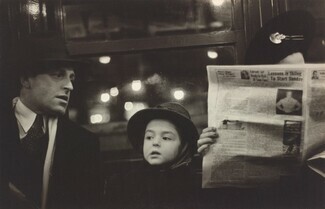 A native of Brooklyn, Louis Stettner began photographing at age thirteen. He served in the Pacific during World War II and moved shortly thereafter to Paris where he developed his skills in photography. 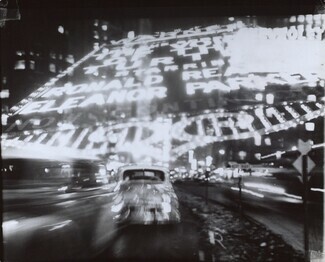 When Stettner returned to New York City in the early 1950s he found inspiration in the night-time luminosity of Times Square. A New York native, William Klein joined the army in 1945 and after the end of the war stayed in Paris, studying painting with Fernand Léger. He also began to photograph at this time. Lured back to New York in 1954 by an offer from Vogue, Klein began to photograph the unglamorous and often aggressive aspects of the city. Experimenting with a wide-angle lens, extreme closeups, disconcerting use of flash, and harsh printing methods, he produced photographs that are by turns confrontational, garish, and occasionally tender. An American gossip columnist, songwriter, and professional party organizer who described herself as a "short, fat, homely piano player from Keokuk, Iowa," Elsa Maxwell was revered for her social savvy. In this image of guests mingling at one of her famous balls at the Waldorf-Astoria Hotel, photographer William Klein's use of blur and harsh printing techniques emphasizes the flare of lit cigarettes and the glare of electric lights to convey a jarring image of sociability among New York's elite. After studying painting at the Art Institute of Chicago, David Vestal moved to New York in 1945 and took photography classes with Sid Grossman at the Photo League. 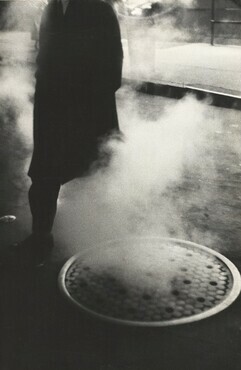 Vestal's photographs of sidewalks, cafeterias, and street festivals depict the moody and atmospheric beauty of the metropolis. The blurred forms of From 21st Street and Broadway, New York, evoke the energy of urban life, yet the rich tonal range and luminosity give the print a lyrical quality. Bruce Davidson grew up in the suburbs of Chicago, the grandson of Polish immigrants. After moving to New York, he began freelancing for <i>Life</i> magazine, but he was unsatisfied with the work assigned to him: "I felt the need to belong when I took pictures....I went back into the streets of New York." 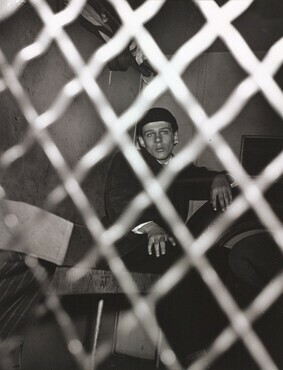 In 1958 Davidson began a series of empathetic photographs of a Brooklyn gang called the Jokers. 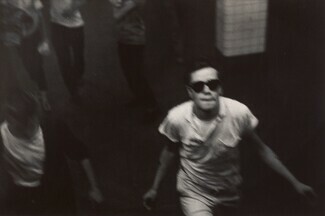 Not much older than the adolescent gang members, Davidson spent several months with them on the streets of Brooklyn, in their neighborhood candy store, and at Coney Island, drinking beer under the boardwalk. Overview: 66 photographs and 7 books created by photographers working in New York City in the years between the publication of Walker Evans' American Photographs in 1938 and Robert Frank's The Americans in 1958 were selected for this exhibition. Photographs on view were drawn primarily from the collection of the National Gallery of Art, with books selected from the National Gallery of Art Library. Subway portraits by Walker Evans, studies of children by Helen Levitt, and views of New York bars and nightclubs by Lisette Model, as well as views of the urban landscape by Louis Faurer, Ted Croner, Roy DeCarava, and others, were included. The film series, Noir on New York Streets, was presented in conjunction with the exhibition. Organization: The exhibition was organized by the National Gallery of Art, Washington. Exhibition curators were Sarah Greenough, curator and head of the department of photographs, and Diane Waggoner, assistant curator, department of photographs. Sponsor: The exhibition was supported by the Trellis Fund and The Ryna and Melvin Cohen Family Foundation.